Update HDR are very poor quality. What happened to the HDR function? All three image were from the same set of Sony raw files. Left most image is using NIK to create the HDR. 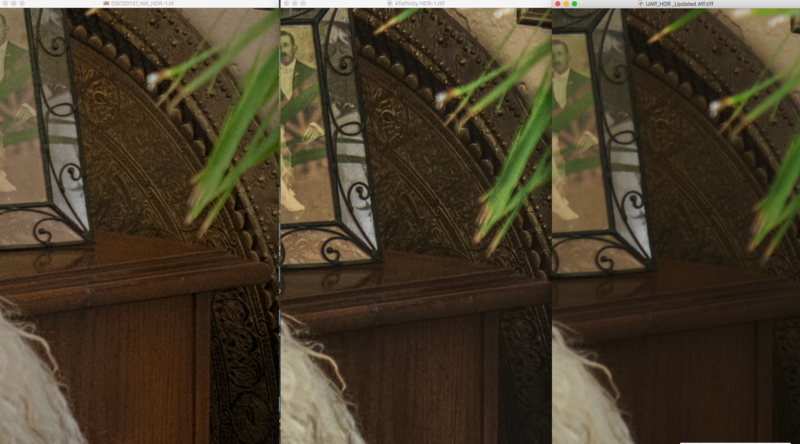 Middle one is HDR from earlier version of Affinity. Right most image is using the latest version of Affinity. Right most image show noticeable detection in detail, color, and shadow areas. If this is an improvement, I may have to return Affinity and use other software. Hi, you posted this in response to an unrelated thread in the Bugs on Windows forum, so I'm going to move it to it's own thread in the macOS bugs forum instead.